Before Elizabeth David and Joanne Harris, before collecting cookbooks, memoirs of passionate cooks and any other book about food and the related world, before of all this there were two books that had unleashed persistent culinary fantasies that still come back to visit me. The first is a book of my childhood, one of those first serious books that children read, one of those of the old times: it’s Heidi by Johanna Spyri. I still have here before my eyes the vivid images evoked in the chapter where Heidi arrives to his grandfather’s mountain cabin in the Swiss Alps, the precise words describing her first frugal dinner made of rustic bread, cheese and warm daily fresh milk. I still feel on my tongue the genuine taste of the cheese, of the buttery milk and crispy bread. The second book dates back to my teenage years, two short lines in the book Voices written by Dacia Maraini, a writer who had already inflamed my imagination in the Silent Duchess and Bagheria, bringing me into a baroque world of Mediterranean flavours. Voices it’s a crime novel dense of sensations and questions as well as the inebriant smells of a hot Roman summer. The protagonist is Michela Canova, a journalist trying to to shed a light on the murder of her neighbour. 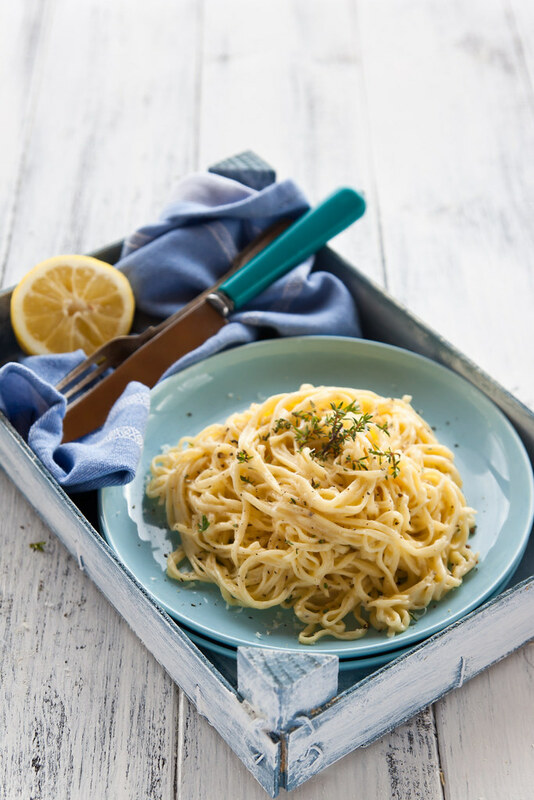 She invites some friends over for dinner and makes them a dish of lemon spaghetti. The two sentences describing Michela cooking the spaghetti are not particularly evocative. Though, all my senses and perceptions were already kindled up by the highly sensory and vivid writing style of the author, so the yellow, the butter and the freshness of those spaghetti got impressed on my mind, as if I had actually tasted them, as if my task was to rebuild after years a map of primordial flavours to take as reference. After ages, yesterday I entered into the kitchen with a precise purpose: make those zesty lemon spaghetti and give a real taste to an idea. Yet, I opted instead for delicate fresh pasta tagliolini made with a hint of black pepper in the dough, a generous dusting of grated Parmesan cheese and some freshly picked thyme, to light up the citrus freshness of the lemon. This is an every day dish, one of those essential preparations that remind you how good simple things are. Note. 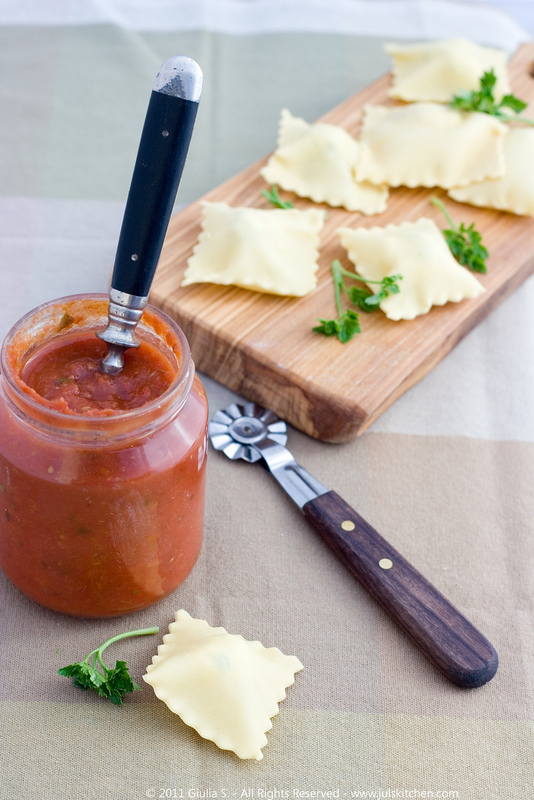 To make fresh pasta follow this recipe! To make fresh pasta follow the recipe or watch the video linked above, adding the black pepper along with the salt in the dough. Let the pasta sheets dry on a wooden surface dusted with semolina flour for about 20 minutes, then cut them into thin noodles. Arrange them well apart on the wooden surface or on a large tray to make them dry. In a skillet melt the butter over low flame with the juice and the grated peel of one lemon. 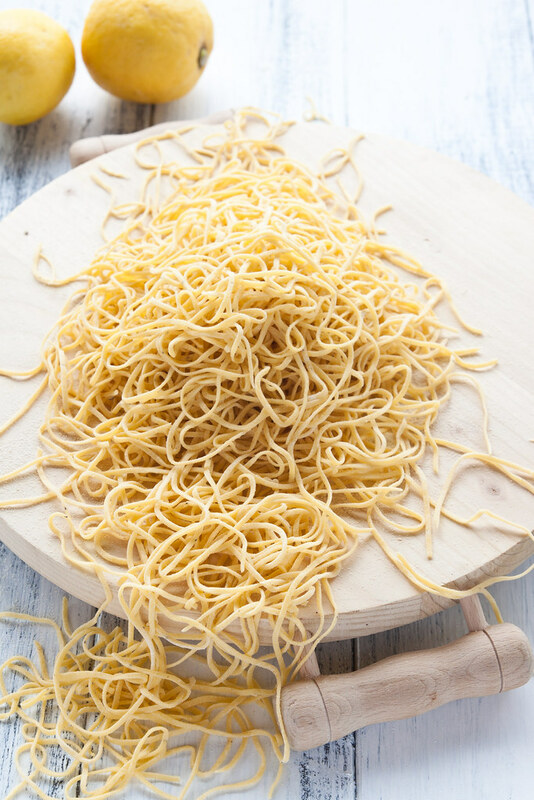 Cook the tagliolini in boiling salted water for about 1 minute, drain them al dente and pour them into the pan with a tablespoon of cooking water. Add the grated Parmesan cheese, the freshly ground black pepper and some fresh thyme. 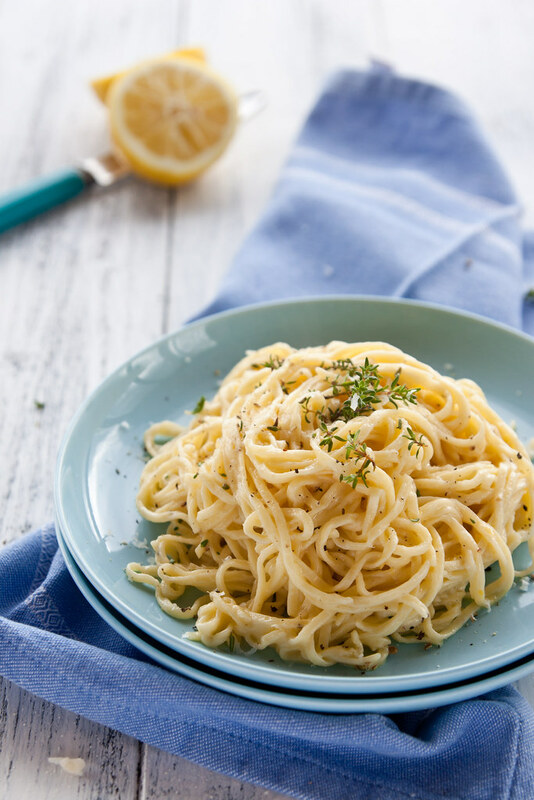 Toss the tagliolini for a minute or two, thus allowing the cheese to melt with the butter and lemon juice into a creamy and zesty dressing from the pasta. Serve immediately and add some fresh thyme. And what about you? 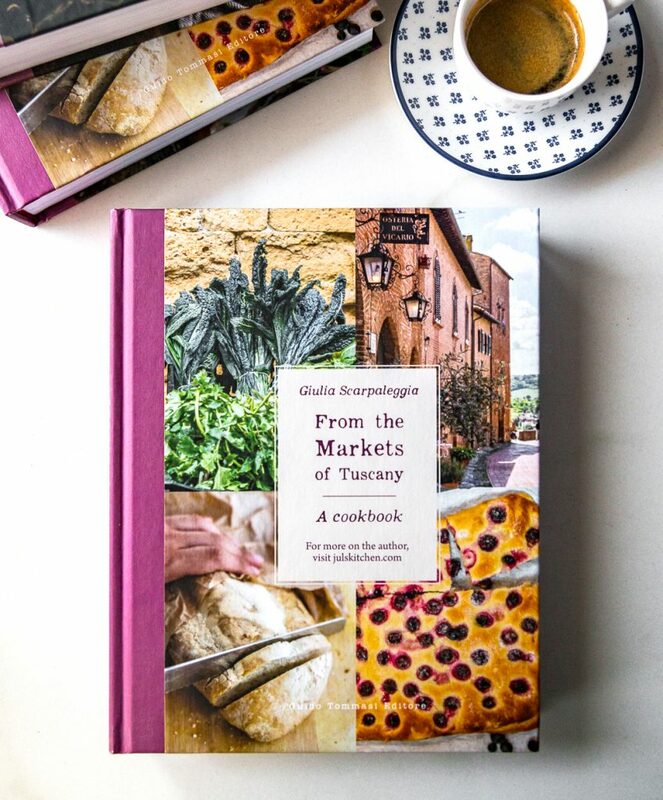 Do you have any recipe inexplicably impressed on your mind after reading a book that has nothing to do with cooking? I mean, maybe an elfic recipe from The Lord of the Rings, or the mindblowing butterbeer of Harry Potter (I need to find that recipe, too!)? 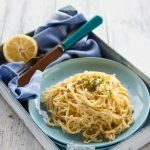 My friend Emiko has the most simple and delicious recipe for tagliolini al limone, paired as usual with beautiful pictures of her dishes and the Tuscan seaside, don’t miss her post. Jamie Oliver has another great recipe for Lemon linguine, spiced up with a bunch of balsamic fresh basil. 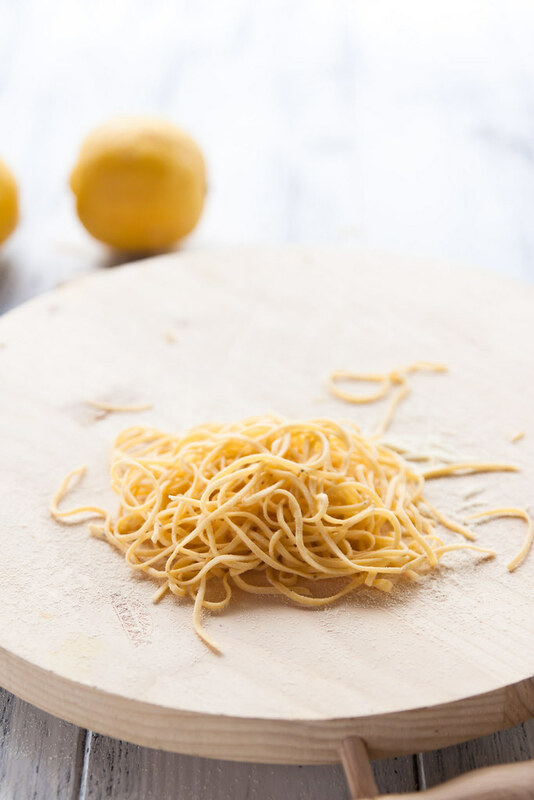 Which is your favourite recipe for lemon tagliolini? Link it here, I’m just craving for more zesty pasta! A fabulous pasta dish! So refined in its apparent simplicity. My favourite! Thank you for linking! I miss fresh pasta so much. I should make it more often!!! This one looks so fresh and yum! I could it a big bowl of this fresh lemon tagliolini! I could eat pasta any given day! 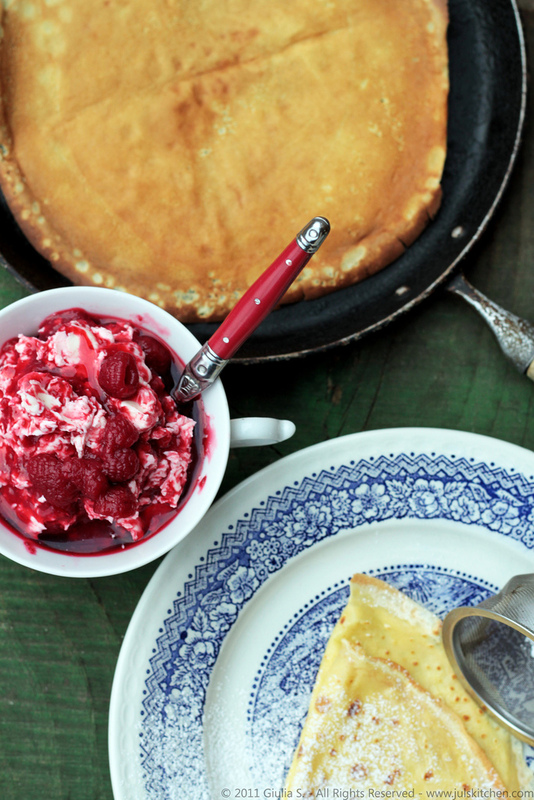 This is a lovely recipe and this photo series is gorgeous! Gorgeous! I’ve never made my own pasta, but have always wanted to. I am terribly intimidated though, because I don’t own a pasta maker. WoW!! that pasta looks delicious!! Love the fresh flavors in this dish! I love the simplicity of this spagetti dish. My first awareness of food was also from Heidi. Like you I remember being excited by the descriptions of the milk and cheese. On my ‘about page’ i talk about toasting the cheese over the coals and trying it myself as a child. I am thrilled to read how you felt when readng Heidi. Oh, I am so glad to share with you such a powerful memory, children books are usually amazing, and everyone has his favourite, but apparently that cheese episode is highly impressive for children: again, it’s the simplicity of the preparation and the genuinity of that food that still make us warm and happy! Looks so delicious! Love the photos too :). Oh yes, the flaming Christmas pudding in English movies always leaves me intrigued. I have that on my list of “to dos/learn about”. I also started drinking tea and making scones because of all of the British movies that I watch. Lovely, lovely scented pasta dish you made. I was perusing the aisles of the store the other day looking for that spaghetti that is hollow. Not to be found! Now I want to search it out even more! Oh, not mention me British food, you know I’m passionate about it… cream tea, and I am an happier person! Combining literature and food: My favorite. I remember reading A Year in Provence in my tiny first apartment all alone on a Saturday and trying to recreate the flavors I read there. Love the pasta recipe, I’ve been trying to get my pastas to have a lighter dough. Is semolina flour like corn flour? it is different, semolina flour is made with durum wheat, not with corn, but it is more yellow and grainy than the usual flour. If you cannot find the semolina flour, use just plain flour, better than using corn flour! I love this dish Giulia! WOW! That pasta looks fabulous! I can almost taste and feel its texture by looking at your beautiful pictures! Oh my gosh! This looks so good. I’m so hungry after seeing this. Congrats on being in the top 9, today! There is nothing better than homemade pasta! Love it. Beautiful pics too. “To make fresh pasta follow this recipe or watch this video, adding the black pepper along with the salt in the dough.” the links don’t work for me. Neither in Google Chrome, no FireFox or Internet Explorer. Do they work for others? Hi Peter, thank you for the shout, I just added the links above the recipe! Enjoy it! I really love how you paired the homemade pasta with such a simple sauce so that the freshness & loveliness of the homemade pasta can shine through. Sounds perfect for spring! 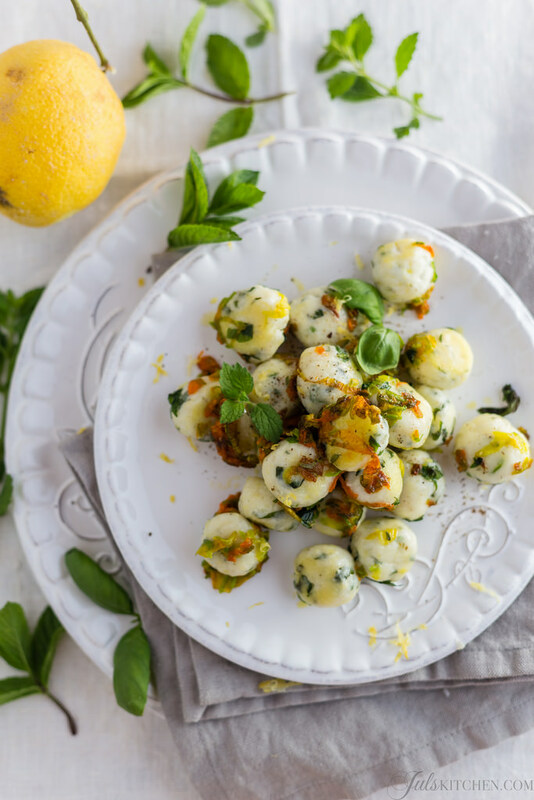 It is actually perfect for spring, when you can play along with different herbs, to enhance the fresh flavour or maybe add a deeper balsamic note with some basil… just choose your favourite bunch of herbs and make it special!